Digital mapping, or geospatial data, is just like the information on paper maps with one very important difference. Because it is in a standard digital format, it can be used in computer based geographic information systems (GIS) that have sophisticated capabilities to integrate, visualize and analyze information. When used like this, geospatial data helps government agencies provide improved services (such as 9-1-1), and also provides decision-makers with highly accessible, accurate information. 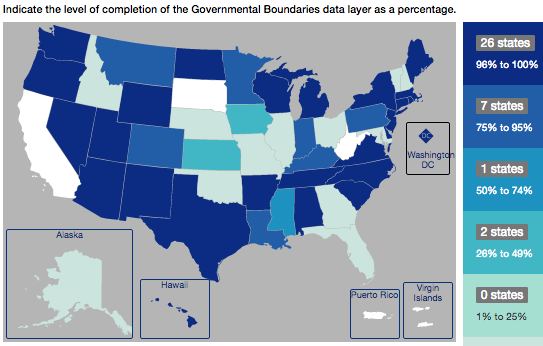 Geospatial data are in constant use throughout local, state and federal government agencies. However, as a nation, we have largely failed over the past two decades to build a comprehensive, shared spatial data infrastructure (SDI) that efficiently meets the needs of society. In many cases, government agencies are creating the same data many times over in different formats, and not effectively sharing information to the best advantage of the taxpayer. States see the as-yet-unrealized opportunities to coordinate federal efforts for the benefit of local governments, while knowing that they are best positioned to 'roll-up' local government data for use by federal agencies. It's just plain easier for that nation to work through 50 states as data coordinators and aggregators than it is to work directly across 3000+ counties and 18,000+ municipalities. NSGIC has branded programs and policies designed to leverage the specific strengths of local, state and federal agencies to build SDI, under the Geospatial for the Nation slogan. The Geospatial for the Nation approach is the definition of good government at work.